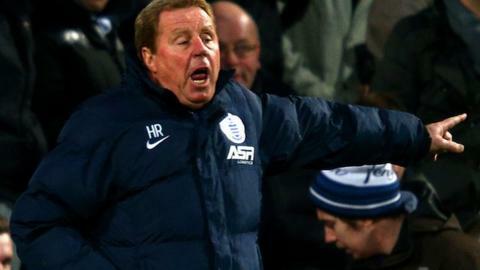 QPR are "not close" to any signings before the transfer window closes on Monday, says boss Harry Redknapp. Rangers sold striker Jordon Mutch to Crystal Palace on Wednesday but had a bid for Wolves forward Bakary Sako turned down. Redknapp said: "We want a couple of loans - if we can find them. We're not close, though, on anyone." He has ruled out releasing midfielder Leroy Fer and wingers Junior Hoilett and Matt Phillips. Redknapp added: "I would rather Junior and Matty stay here. Les Ferdinand [head of football operations] said there has been some interest in Junior from a German club. But we're not overloaded with players and we're looking to strengthen not weaken." On attempts to sign Sako, he said: "We made an enquiry and that's as far as it went. Les spoke to the people there - it's not gone any further." He also has ruled out moves for Blackburn striker Rudy Gestede, Rubin Kazan midfielder Yann M'Vila, Tottenham front man Emmanuel Adebayor and striker Dani Osvaldo, currently on loan at Inter Milan from Southampton. "You can sit and talk about players all day, but you need to get them over the line. We're nowhere near yet."